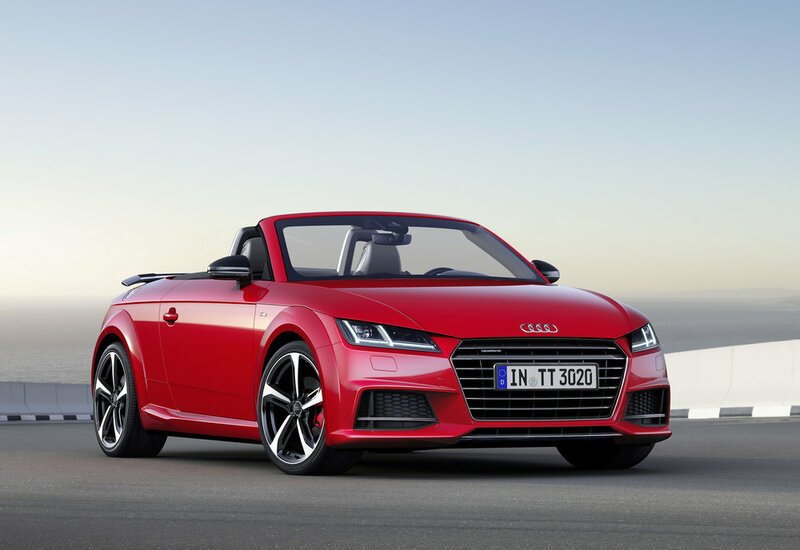 Audi has added a limited edition TT S line competition model - in both Coupé and Roadster guise. The special model adds an array of sporty details for the exterior and interior – from the fixed rear wing to the Audi virtual cockpit with sport screen. The Singleframe grille, the blade at the front, the exterior mirror housings and the diffuser insert all come in a high-gloss black finish. The fixed rear wing of the limited-edition model is also finished in high-gloss black, while the tailpipe trims of the exhaust system have a black chrome finish. The sport suspension with firm spring/damper settings lowers the ride height of the TT S line competition by ten millimetres (0.4 in) compared with the basic version. And the standard Audi drive select system enhances driving dynamics, enabling the driver to modify their TT’s characteristics in auto, comfort, dynamic, efficiency and individual modes. The TT S line competition is factory-fitted with 19-inch wheels in a gloss black five-spoke blade design, fitted with size 245/35 tyres. Behind the wheels are red-painted brake calipers. 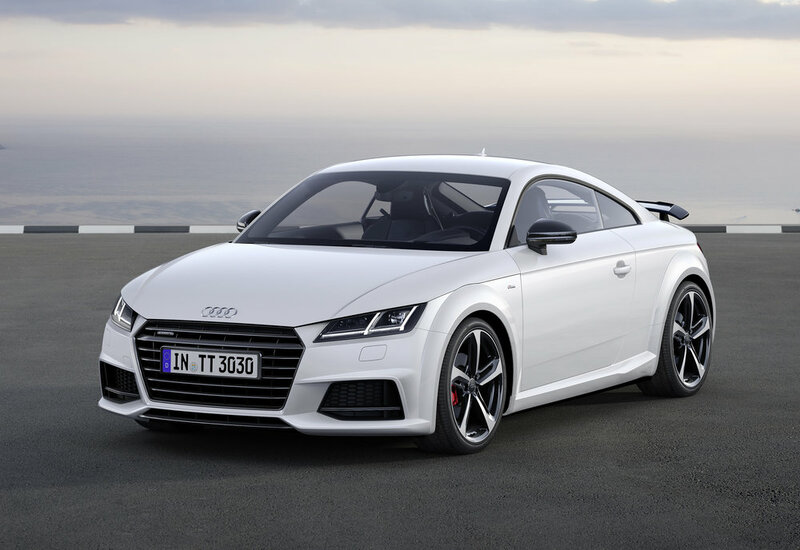 The choice of body colours comprises glacier white, nano grey, tango red and the new TT colour Ara blue. The roof of the TT Roadster S line competition is black. In the cockpit, S sport seats feature embossing in the backrests, as well as contoured side supports – optionally with pneumatic adjustment. Electrically adjustable lumbar supports are integrated as standard. The flat-bottomed S line contoured sport leather steering wheel in three-spoke design has multifunction buttons for quick operation of the navigation, media, phone and speech dialog system. The Audi virtual cockpit comes as standard, with the limited-edition model adding a sport screen with central tachometer and integral speed display dominating the all-digital instrument cluster. Seats and door armrests are upholstered in a combination of leather and Alcantara, or optionally all in Fine Nappa leather – in both cases in black. Grey contrasting stitching adorns the seats, leather steering wheel, doors and gear/selector lever knob. The inlays are in matt brushed aluminium, while the air vents, the clip around the centre console and the seat trims have a slate grey chrome paint finish. The special TT S line competition is powered by the 230 hp 2.0 TFSI engine and is available as a front-wheel-drive version with six-speed manual transmission or S tronic, and as a quattro with S tronic. With UK pricing yet to be confirmed - prices in Europe start at EUR 41,940 (Approx. £36,000) for the Coupé S line competition, while the roadster costs from EUR 44,340 (Approx. £38,000).